Monatliche Zeitschrift, vorzuglich der Untersuchung der wenig gekanten Phanomene des Seelenlebens gewidmet. Leipzig, Germany, and New York, NY. Language: German. Publisher: Verlagsbuchhandlung von Oswald Mutze, and Ernst Steiger in New York. Editor: Alexander Aksakov and Gregor Constantin Wittig; Dr. Friedrich Maier; Dr. Paul Sunner. 1/1, January 1874-1925. 1.20 Thaler, 5 Reichsmark a year. 48 pp., 6 x 8. The Prospectus printed in the first issue announced the editor's intention of exploring "the least known phenomena of psychic life." Psychische Studien was the product of the cooperation between Gregor Constantin Wittig, who was a Catholic theologian and a reader for the publisher Oswald Mutze in Leipzig, and Imperial Councilor Alexander Aksakov, who supplied the funding as he had earlier done for Rebus (in Russian, but published in Germany for political reasons) and Revue de Psychologie Expérimentale in Paris). He had proposed to start a spiritualist journal, the Review of Mediumship, in St. Petersburg in 1876, but was denied permission. Aksakov saw Psychische Studien as a way of publicizing the Bibliothek des Spiritualismus fur Deutschland which he and Wittig had begun in 1868, and entrusted Wittig with the editorial responsibility, giving him "full freedom to publish his own ideas on the phenomena --which tended to seek the explanation in the theory called psychic rather than in the spirit theory." Aksakov, Animisme et Spiritisme (Paris: Leymarie, 1895), 23. (Aksakov thought Wittig had gone too far when he began to discuss in the journal the possibility of photographing a hallucination.) Wittig's increasingly "psychic" rather than "spiritual" interpretation of the phenomena in turn caused a split among believers in the 1880s over "Dr." Bernhard Cyriax, whom Wittig had initially recommended and then exposed as a fraud. Cyriax went on to found Sprechsaal and Spiritualistische Blatter as exponents of the view that the phenomena were directly produced by the spirits themselves, while Psychische Studien under Wittig's direction became the chief advocate in German-speaking lands of the parapsychological view. See C. Kiesewetter, Geschichte des neueren Occultismus (1891), 463-464. For the correspondence of Wittig and A.J. Davis in the 1850s, see "History of the Introduction of the Harmonial Philosophy into Germany, Compiled by Mary F. Davis," Psypioneer 1/10 (February 2005), online at http://www.woodlandway.org/PDF/Leslie_Price_PP10.pdf. Psychische Studien is said to have been the continuation in some way of the otherwise unknown Spiritisch-rationalistische Blatter of Leipzig. 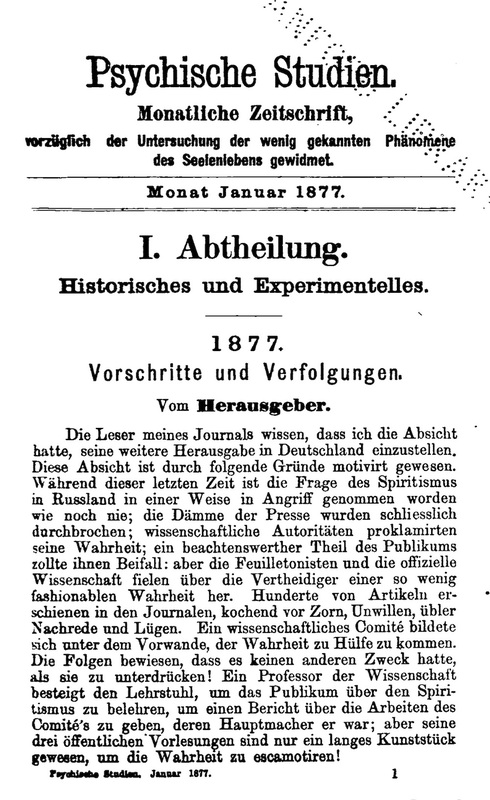 The journal was divided into three parts: "Historisches und Experimentelles," "Theoretisches und Kritisches," and "Tages-Neuigkeiten, Notizen, etc." The theoretical and critical section was largely filled with original material, while the other sections drew on experiments and matters of interest found in spiritualist journals and the daily press around the world and are, accordingly, of more interest to the general historian. In its early years, the journal had regular notices on the new Theosophical Society and H.P. Blavatsky and her claimed powers to control spirits and matter by her magical power, including a report (secret, but declassified for publication) prepared by W.Q. Judge on the magical practices engaged in by the Theosophists in order to separate themselves from their bodies. "Giebt es eine Magie und Zauberer?" Psychische Studien 4/5 (May 1877): 193-201, now translated in Deveney "An Unpublished Lecture by W.Q. Judge in 1876 on His Magical Progress in the Theosophical Society," Theosophical History 9/3 (July 2003). The journal also featured the long account by "F.H." (Franz Hartmann) on his stay in India with H.P. Blavatsky. "Was man in Indien lernen kann" (October and November 1884). During the half-century of the life of the journal, it published or commented upon everyone interested in parapsychology and many of those interested in spiritualism: Edward W. Cox, A. Butlerov, Carl Friedrich Zöllner, Louisa Andrews, "M.A. Oxon." (W. Stainton Moses), Gustave Bloede, Adelma von Vay, J.M. Roberts, William Crookes, Henry Slade, C.C. Massey, George Sexton, et al. Despite the journal's importance its survival required a continuing infusion of funds from Aksakov, and the circulation remained small. In 1881 it claimed 2,000 readers in Germany but ruefully admitted that it had not reached that number of subscribers. "Kurze Notzen," Psychische Studien 8/9 (September 1881): 425-426. Crabtree 962. LOC; NYPL; Harvard microfilm.